Fill in your details below and we will let you know within 24 hours if we can get Nusfjord to you with haste! Today, Nusfjord is a tranquil fishing village in the Lofted archipelago in northern Norway. 50 years ago, business was booming when the codfish would come for spawning. But, travel back in time and Nusfjord is completely transformed. Sailing ships dominate the fjord, and the rocky beauty of the island is masked by vast forests. Visit the heyday of Nusfjord's maritime commerce and expansion, and success may be yours! 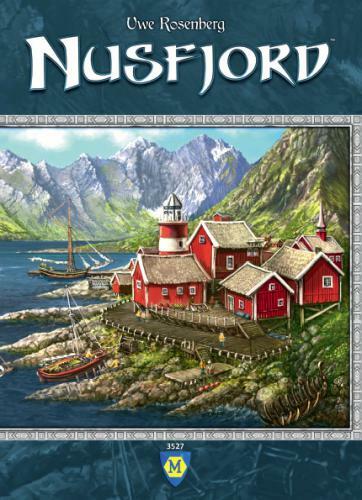 As the owner of a major fishing company in Nusfjord, your goal is to develop and expand the harbor and surrounding landscape. You will do this by using your workers to help you develop your fishing company, persuade village elders in the council to join you, and build buildings for valuable effects and victory points. Plus, don't forget to expand your fishing fleet to increase your fishing capacity, and issue shares in your company for a quick gold or two. You also need to balance the clearing and reforesting of your land for building resources. And don't forget the ever important gold needed to buy shares, which can earn you additional fish and points. In the end, the player with the best fishing company (and most points) wins the game!